The Films of World War II Monday, February 10 at 1:00 P.M. The American World War II Combat Films presentation and discussion with Saint Louis University professor and author, Dr. Vincent Casaregola, has been rescheduled for Monday, February 10 at 1 pm. Join us for a fascinating afternoon! The event will be held at the library on 2901 State Street. No registration is required. If you have questions, please call (618)452-6238. Posted in News, Events, & Classes | Comments Off on The Films of World War II Monday, February 10 at 1:00 P.M.
Closed Monday, February 17, 2014 in Observance of President’s Day. Normal hours resume Tuesday, February 18, 2014. Posted in Closings | Comments Off on Closed Monday, February 17, 2014 in Observance of President’s Day. Normal hours resume Tuesday, February 18, 2014. Tales for Tails! Every Monday Evening from 6-7 P.M.
Every Monday evening from 6-7 p.m., kids in grades K-5 can practice reading with a dog from C.H.A.M.P.! at the Niedringhaus School Location at the corner of 29th & State St.
Posted in News, Events, & Classes, Reading Program | Comments Off on Tales for Tails! Every Monday Evening from 6-7 P.M.
January Book Club Monday, January 27, at 6:30 P.M. or Tuesday, January 28 at 1:00 P.M. This January, we are reading “Everything is Illuminated” by Jonathan Safran Foer. Take part in the discussion on Monday, January 27, at 6:30 pm or Tuesday, January 28 at 1:00 pm. Both meetings will take place at the library on 2901 State Street. Questions? Call (618)452-6238 ext 2. Posted in News, Events, & Classes, Reading Program | Comments Off on January Book Club Monday, January 27, at 6:30 P.M. or Tuesday, January 28 at 1:00 P.M.
From Saturday, January 18 at 6 p.m. to Tuesday, January 21 at 7 a.m., the library’s online catalog will be offline and unavailable while the library software is being upgraded. During this time holds cannot be placed. Thank you for your patience! If you have any questions, please call (618)452-6238. 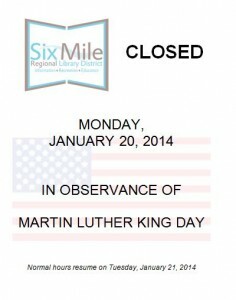 Closed Monday, January 20, 2014 in Observance of Martin Luther King Day. Normal hours resume on Tuesday, January 21, 2014. Posted in Closings | Comments Off on Closed Monday, January 20, 2014 in Observance of Martin Luther King Day. Normal hours resume on Tuesday, January 21, 2014. 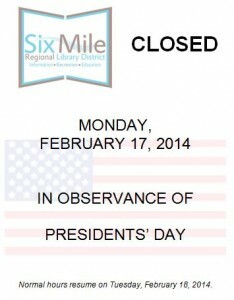 The Six Mile Regional Library District will close at 4:30 P.M. Tuesday, January 7, 2014. Normal hours resume Tuesday, January 7, 2014.